I really love the last line “Do not waste your time and consult one of our service centers”, because that is exactly what you’d be doing if you did. Also , accompanying this “warning”, was a loud, annoying, continuous beeping sound, coming from my laptop. I can imagine someone seeing this for the first time, and who had never heard of these kinds of tech support scams before, panicking and calling that number. But anyone who does is probably going to get ripped off for hundreds of dollars. Now, it just so happens that when this “warning” popped up out of nowhere, I could not close the window. Using Alt+F4 did not work, and clicking the “X” would have opened up other potential warnings – even download. So here was no apparent way to close it. Trying to close the browser does not work; trying to close the window does not work. The beeping continues and the “warning” seems dire. I closed the fake scam window using Task Manager to end the browser process containing the warning – which is nothing but a web page designed to look like a warning. I was using Firefox at the time, so I just found the Firefox process in Task Manger, and right-clicked on it and clicked “End process”. You can do this with any browser process, although in some browsers, like Chrome, each open browser tab is a separate process. If you’re not sure how to end the browser process that is displaying the warning, simply restart your PC. Keep in mind that when you restart to close the fake scam warning, when you reopen your browser after restarting, it’s will ask if you want to restore the pages that were open when restarted your computer. In this kind of situation, always click “No”. Clicking “Yes” may put you right back to where you started with the fake Tech Support Scam “warning” beeping away and staring you right in the eyeballs. You don’t want to get yourself stuck in that loop. It’s not real. It’s just a scam. The whole point of this kind of scam is to get you to call a phone number – where upon you’ll be told your PC is terribly infected, your personal data in at risk, in fact all your data might be immediately erased if you don’t get this fixed up right now. And of course, they’ll be at the ready with the remedy. All you have to do is let them connect to your PC and they’ll either run a fake scan that show hundreds of problems, and then tell you that your PC can be fixed up if you just give them a credit card number. And you’ll be charged a hundred dollars or more. After you pay these pirates, they’ll install some freeware on your PC, then run another fake scan that shows they’ve miraculously fixed your PC and you’re good to go. It’s just a scam to steal your money by frightening you. It’s all about using your fear to get you to panic and to get your money. Know this: Windows never pops up warnings telling you that you’re in danger and to call a phone number. 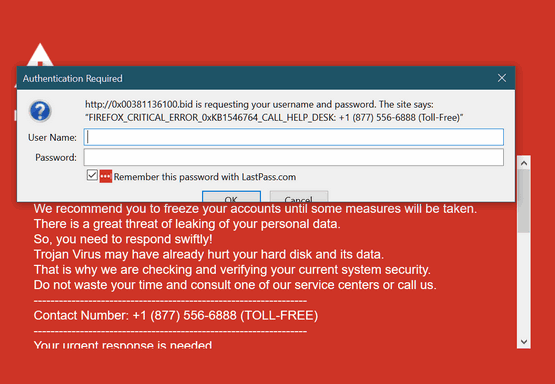 No legitimate security software will show you warnings with a phone number to call and listing a series of dire consequences if you don’t comply. The reason why these kinds of tech support scams are everywhere and why they continue to evolve is because these criminals are making millions of dollars by tricking people into calling for help. If you see one of these scams, don’t panic. Stop and think. If you can’t get rid of the warning dialog (actually a web page) just restart your computer. If, after restarting your computer your browser asks you if you want to restore the pages that were open when you restarted your PC, click “No”. The best way to keep from being a victim is not to panic. Stay informed and use your common sense. The more you know the less you’re likely to fall for one of these scams. We Help Keep You Save On the Internet… Get our daily computer tips delivered to your inbox! Get daily tips, tricks, alerts and more - delivered to your inbox! Our daily tips, tricks, and more are delivered to your inbox every day! And you can unsubscribe at any time. Thank you! I’m very familiar with this nonsense and had dozens since the beginning of this year. and nothing is left on your system. It’s a different story for people who don’t use sandboxing for their browsers. and cookies and temp files and possibly add-ons. These are just web pages, they don’t leave anything on your computer other than cookies. You don’t get malware from cookies or “temp files”. There is being careful, then there is being paranoid. We are not fans of Sandboxie… for a number of reasons. If you’re truly concerned about security, using a VM would be much more secure. I had this happen exactly as you explained but thanks to you both I knew what to do. It is alarming for sure but like you said “don’t panic”. I used Task Manager and got rid of it. Thank you so much for all the good advice you share. Thanks for the great advice as always! How do they get the scam warning on your screen in the first place? It’s just a specially designed web page, Ellie. How is this a demonstration of scams “continuing to evolve”? This is just another one doing the same thing as a million other ones have done – scare the user into calling a phone number and let a scammer remote in to their computer. Been happening for a long time, and will continue to be successful as long as there are gullible people in the world. They continue to evolve in that they are becoming more sophisticated. Unlike you, Scott, not everyone who reads these pages is an advanced Windows user. This ad is step up the generational iterations of scam ads in that it’s not as easy to close as most of the older ones which can be dispatched with ALT + F4 or just closing the tab. If everyone was an advanced Windows user like you, there would be no need for Windows tips and tricks – and no need to warn people not to fall for scams like this. Being condescending doesn’t help people, Scott. We will never forgot our beginning days with Windows and the Internet over two decades ago… we will never look down on people for not knowing as much about computers as advanced users do. Using the word “evolution” was just an easy way of warning people that criminals will continue to get smarter and continue to use every trick to get easy money from those who are most vulnerable – and that some ads can’t be closed easily (Alt + F4 ) or closing the browser tab or browser. We’ll continue to try to protect those most vulnerable by doing whatever we can including taking license with the meaning of the word “evolution”. We don’t think being condescending is a good approach. Just because someone is not as smart as you are with computers, does not make them a fool. I’m one of those “not as smart” old farts, that has a computer. THANKS FOR THINKING OF US. number. (that part of it worked). However this is what I found on Facebook when browsing through my many relations pictures. In among the pictures one caught me eye. I couldn’t make out what it was so I brought it up and there was a letter upside down — when turned it upright there was my complete visa number in bold print (not a picture of it just the number.—I immediately call Visa…I tried to print it but the printer was not working so I saved it. BUT WHERE I don’t know. That wasn’t a sane thing to do but I wasn’t really in my right mind at the time. [ BY THE WAY I HAVE NEVER LET ANYONE USE MY CARD]…I WILL BE ASKING FOR YOUR HELP IMMEDIATELY.